Buck Island Reef National Monument is unique. It's the only undersea national monument in America, and it's probably the most popular single tourist attraction on St Croix. At its heart is the pristine, 176 acre Buck Island. Just one-and-a-half miles off the north shore of St Croix, the island offers picture-postcard white-sand beaches, hiking paths, and a world-famous underwater trail for snorkelers. Buck Island first shows up on a French map from the 1660's. It was referred to on that map as Ile Vert (Green Island). A different island nearby was known as Ile a Cabritz (Goat Island). During the early Danish period, the names of the two islands were transposed on maps, so that what was originally Green Island is now called Buck Island, and what was originally called Goat Island is now Green Cay! 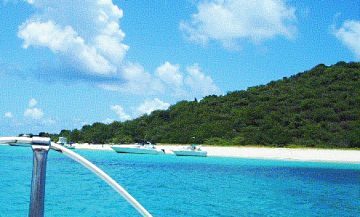 In past centuries Buck Island was frequented by the likes of Blackbeard, Captain Kidd, and Henry Morgan. Otherwise, though, the island has always been uninhabited. In 1961, President Kennedy was taken on a tour of Buck Island. He was so impressed with the natural beauty of the place that he declared the island and surrounding waters a national monument covering 880 acres. Under this designation, the monument came under the protection of the National Park Service. In 1998, President Clinton added an additional 18,000-plus acres of reef and seabed to the monument as part of the worldwide Coral Reef Initiative. tour operators licensed by the National Park Service. A typical tour is a half-day or full day trip which carries you to the island by either sailboat or power boat. Generally, you'll be given a guided snorkel tour of the marked underwater trail, as well as some time to lie on one of the fabulous beaches and explore the island's interior on its hiking trails. There are picnic facilities and restrooms on one side of the island, but you'll need to bring your own food. The snorkeling and diving at Buck Island are often touted with words like "spectacular". It's sometimes advertised as among the best in the Virgin Islands. This is stretching things, to say the least. In my view, the snorkeling here is good, not great. Hurricanes in recent decades have led to coral damage, reducing the quality of the reef here. It's certainly well worth a visit. For the snorkeling, and for the island itself, with its varied plant and bird life and its spectacular beaches and perfect, turquoise waters.